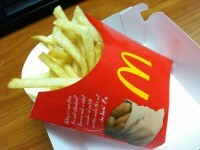 McDonald’s – If you don’t like the fries at McDonald’s, then something is wrong with you – seriously. Age-old classic fries that top off any extra value meal, these fries are up there with the best in my book. Plus, even my little princess loves the fries in her Happy Meals, and frankly that is all that matters. Wendy’s – A few years back (hell it could have been more than that) when Wendy’s came out with their Sea Salt fries, I was skeptical. Not anymore! These fries are insane. Crispy and salty, just how I like ‘em! Plus they go great with a junior bacon cheeseburger! Chick-fil-a – Waffle fries, need I say more?!?!? Perfect fries to dip in some Heinz Ketchup and I have never had these fries that were cold or soggy. They always seem to be perfect in my book. Arby’s Curly Fries – A true American tradition (well, I’m sure it is not American but you get the point). Curly fries are insane with an Arby’s Beef ‘n Cheddar and they give Arby’s a unique reason to go there, simply for the curly fries. Five Guys – These fries are always hot and crispy, and they add a little bit of seasoned salt to make it perfect! I always seem to get more than the cup allows, which is awesome too! Give me more damnit!